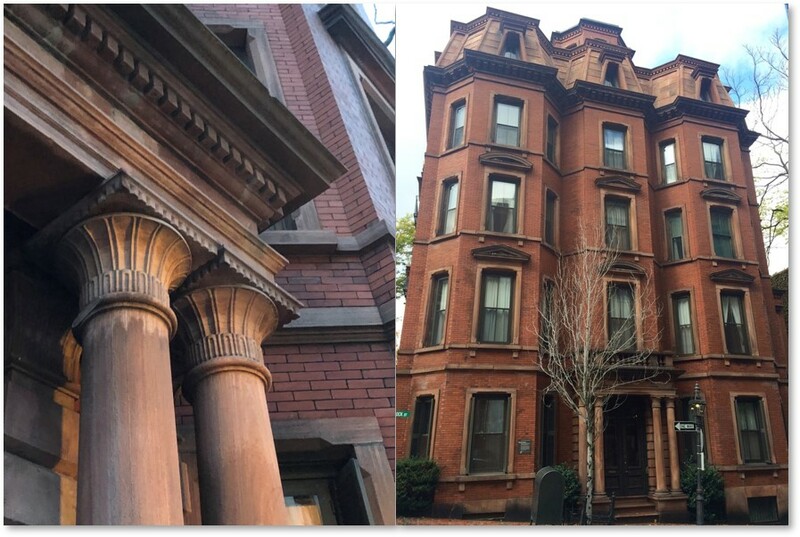 In the second part of my post about Egyptian Revival monuments and structures in Boston, I’ll discuss more of the design elements as applied to structures around the city.. If you are unsure what that style looks like, read Part 1 for a list of design elements. We have lost the original wooden gate to Forest Hills Cemetery (replaced by Gothic Revival granite) and the office/store building at 295 Washington Street. Other examples of Egyptian Revival remain in Boston, however. I have located five other structures around the city.. 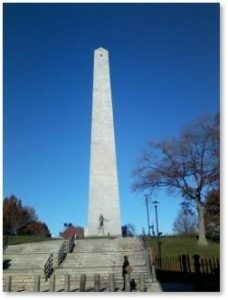 When Bostonians see the Bunker Hill Monument, we think about the Revolutionary War, the Battle of Bunker Hill, or perhaps the death of Dr. Joseph Warren, It does not remind us of Ancient Egypt. Yet the monument was designed as a classical Egyptian obelisk, one of the main themes of the Egyptian Revival Movement. Other obelisks exist in London, Paris, and Rome. Known in those cities as Cleopatra’s Needle, these structures differ in that they were removed from Egypt and transported to Europe. Hieroglyphic writing marks their sides. By contrast, the Bunker Hill Monument was constructed locally. The monument commemorates the first major battle fought by Colonial forces against the British in Charlestown on June 17, 1775. It marks the site where Colonial forces constructed an earthen fort, or “redoubt,” prior to the battles on what is now known as Breed’s Hill. Solomon Willard designed the obelisk, Gridley Bryant supplied the granite from his Quincy Quarry and even built a Granite Railway to move the huge slabs of stone. Two granite obelisks also guarded he base of the railway’s incline — but much smaller. The Visitor Center, or Lodge, at the monument’s base abandoned the style of ancient Egypt for the Greek Revival style. Go figure. You can visit the Bunker Hill Monument and climb its 294 steps to the top, listening to your heavy breathing echo off the granite walls all the way up. 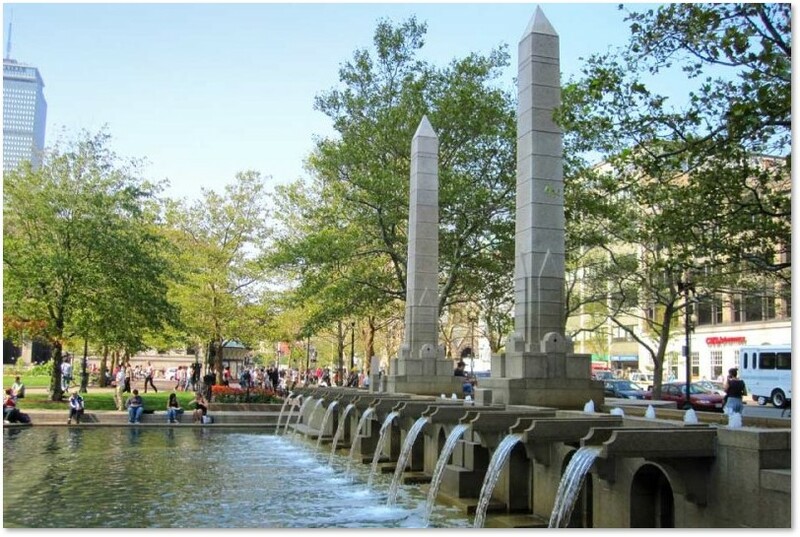 Even though they are 20th Century constructions and thus not part of the Egyptian Revival movement, two more obelisks anchor a fountain in Copley Square. Far smaller than the Bunker Hill Monument, they stand atop a series of 12 rectangular channels that spill water into a stepped pool. The obelisks have a few simple, geometric design elements but no hieroglyphs. This fountain, with its line of water channels, reminds me of the Avenue of Ram-Headed Sphinxes at Karnak, Egypt, each one separated by a rectangular space. I think this newer design could fit well into any ancient Egyptian city. The Copley Square fountain is open to the public 24 hours a day, seven days a week but the water doesn’t flow in the winter. Large overhanging cornices above the windows, although not in the typical curved cavetto design. I would love to explore this house on the inside and see if the Egyptian Revival motifs carry though the interior decoration. Alas, it is a private home and I do not wish to intrude. From the photos I have seen online, however, the two apartments within have been modernized beyond reference to any historical style and only the oval staircase maintains the house’s original character. You can walk past it on Hancock Street and appreciate the interesting architecture of #57 from the outside. What better relation to the dead could a style have than in a mortuary? That’s where Boston’s departed “rested” during the hiatus between death and interment. Boston’s Healthcare for the Homeless program serves a sensitive population. If you visit the lobby, please be considerate of those who are ill or disabled and depend on the facility for their care. Well, okay. I’ll agree with the restraint. 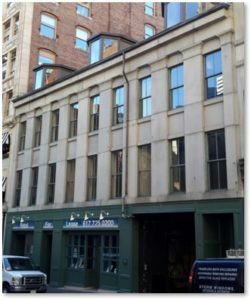 I invite you to stroll down Bromfield Street—an easy walk from the Old Granary Cemetery’s more impressive Egyptian Revival Gate. Just past Province Street. look to your right and up. It it Egyptian Revival? You decide. 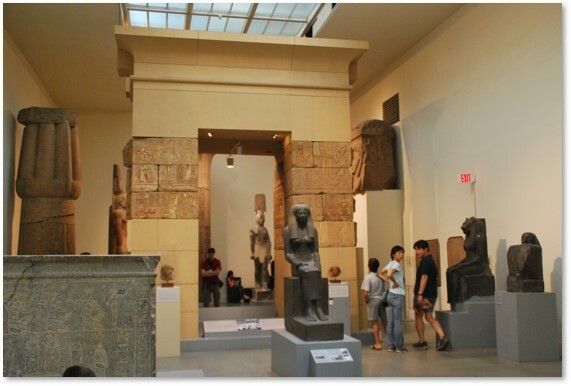 I would be remiss to discuss any reference to Ancient Egypt in Boston without mentioning the world-famous Egyptian galleries at the Boston Museum of Fine Arts. To be clear, these exhibits do not represent the Egyptian Revival movement.They are instead the real deal from thousands of years of Pharaonic rule along the Nile River. 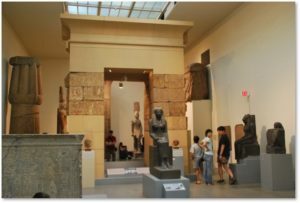 In these galleries you will see huge columns and small scarabs, sarcophagi and spirit doors, gods and goddesses, pharaohs and commoners, canopic jars and amphorae. These objects immerse you in the spirit of ancient Egypt. If you want to know what inspired the Egyptian Revival style, you can visit the MFA to get a good overview without ever leaving Boston. Just head down Huntington Avenue and pick up a gallery map inside.You will find the extensive Egyptian Galleries to the right on both the first and second floors.Take your time, there’s lots to see. Boston has other obelisks. In the 19th Century, these stones became popular as grave markers so you find them all over cemeteries in New England. Some are big, others small. Carved from marble or granite they may have plain faces or elaborate carving. Many are unremarkable and it would be impossible to catalog them all. Two exceptions, however, are the Fuller Obelisks in Mount Auburn Cemetery. Erected in 1848 according to the will of Boston Lawyer Abraham Fuller, they occupy two lots at the top of Mount Auburn near the Washington Tower. Each stands over 20 feet high, making them the tallest such grave markers in the nation’s first garden cemetery. The names and histories of Fuller family members are carved on the four sides of the two obelisks. 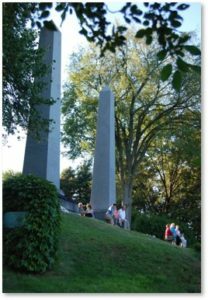 In an interesting note, these two huge obelisks entered Mount Auburn Cemetery through the Egyptian Revival Gate I discussed in Part 1. The process must have looked like workmen in Ancient Egypt erecting yet another mortuary temple, only from gray granite instead of red sandstone. 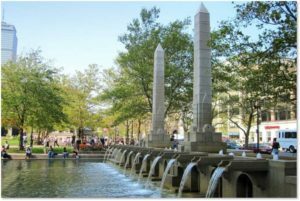 Visiting the Fuller Obelisks will give you the added bonus of an unobstructed view of Boston, Boston Harbor, and nearby communities. If you’re not up to climbing the bunker Hill Monument climb Washington Tower for an even better perspective with fewer steps. And somewhere in the city is a door knocker with the head of an Egyptian Pharaoh. I have not yet found it. If you know where it is, please let me know.